Despite the popular belief, motivation is an internal thing. You cannot directly affect it. Therefore, the main responsibility of a manager is to ensure an employee is appropriately trained to do their job. You need to be prepared to dedicate the majority of your time as a leader to achieving training goals with your team. It's not easy nor straightforward. It takes time and requires the support of the entire organization. Often, you'd be poised to just do the work yourself. When this happens you need to remember that individual contribution is no longer your job. As a leader, your job is to build and empower your team. 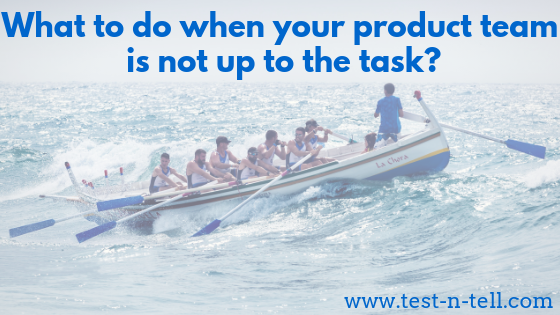 Besides, odds are, you run out of hours in a day if you'd try to do everything yourself. Your goal is product success - your way to achieve it is by training your team. What to do when motivation is lacking? Ideally, you mitigate this problem by hiring smart. Recruitment is when you make sure the people who join your team have sufficient motivation. It is especially relevant to a PM role. PMs need to be motivated to do their job - but they also need to be empathetic to the problem their product will be solving. Some product leaders believe empathy to be the key skill of a product manager. But what if you didn't hire your team? Anything you can do about the lack of motivation? Yes and that is finding better-suited roles for people or letting them go. Being a leader could be tough. Sometimes you need to let people go to the mutual benefit of them and the company. But before doing that you might find a better-suited position for people. A role that could motivate them. I knew some PMs who pivoted to UX, some who went back to development, some other switching to purely business roles in customer success or sales. By design, PMs are working on the intersection of various roles and skillsets. Hence it's only natural they could move around the broad landscape of roles within a business. When the move is not possible or it hasn't worked out - you'd have to consider letting people go. It's never a pleasant thing to make someone redundant but often the person in question ends up better as the result. There is a clear distinction between individual contributor and leadership roles in Product Management. If you've found yourself in a leadership product role - your job is to improve your team. Some of the team members might lack training or motivation to achieve success in their role. When that's the case, as a leader, you need to provide sufficient training to your team first. If motivation is the issue - you might need to consider a role change for the person in question. Successful product teams have both: inner motivation and sufficient training to excel in their job!